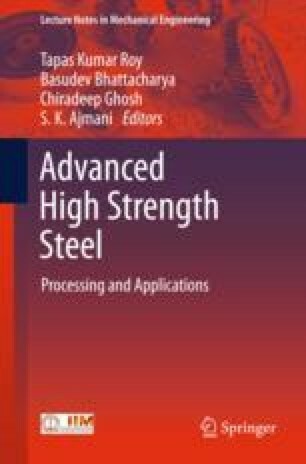 Deformation texture, microstructure, and tensile properties have been studied in a high Al containing TWIP steel with a composition Fe–12Mn–0.6C–5.5Al. Alloy was cold rolled to a large reduction in thickness (ε t ≈ 3). The deformed microstructure has been characterized by X-ray diffraction and electron backscatter diffraction. Bulk X-ray texture reveals the development of Bs-type texture with deformation. Microstructural features indicate the occurrence of different deformation mechanisms at different reduction levels. At very early stage of deformation, dislocation slip is the dominant mechanism, at intermediate stage, deformation takes place by twinning, and at large strains, the deformation is governed by shear banding. Significant improvement of yield strength is observed by the addition of Al. This work was inspired by a grant from R & D Division, Tata Steel India Ltd. The authors are grateful to Drs. S. Chandra and S. Kundu for many useful discussions. The extensive use of microscopes at the Advanced Facility of Microscopy and Microanalysis (AFMM) facility and XRD at the Institute X-ray facility, Indian Institute of Science, Bangalore is also acknowledged.